A beer mojito cocktail mixed with Berliner Weisse. It is soo good, friends! I haven’t enjoyed writing about a beer cocktail as much since the Gose Beergarita recipe I posted. Perhaps I’ve been bewitched, in keeping with the origins of the name of the mojito cocktail? As a quick note, mojitos originated in Havana, Cuba back in the 1500s when the Cuban sugar cane fields were worked by African slaves. The name ‘mojito’ is said to be rooted in the African word ‘mojo’ the meaning of which is to bewitch. What exactly is a Beer Mojito? 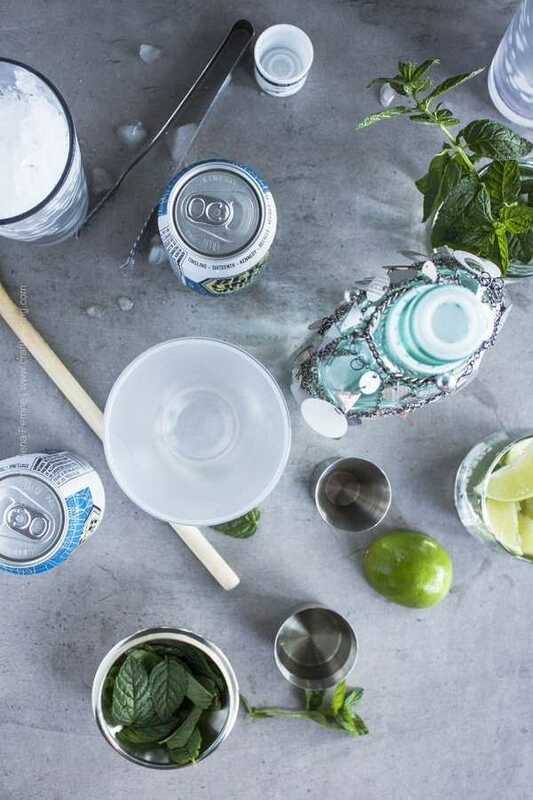 A mojito in which the club soda is replaced by a refreshing, flavorful all natural craft beer. Of all beer styles you can use in a mojito I believe that the best one is a classic Berliner Weisse style, closely followed by gose. Besides the Berliner Weisse style beer the rest of the ingredients are the same as you would typically use in a regular mojito. 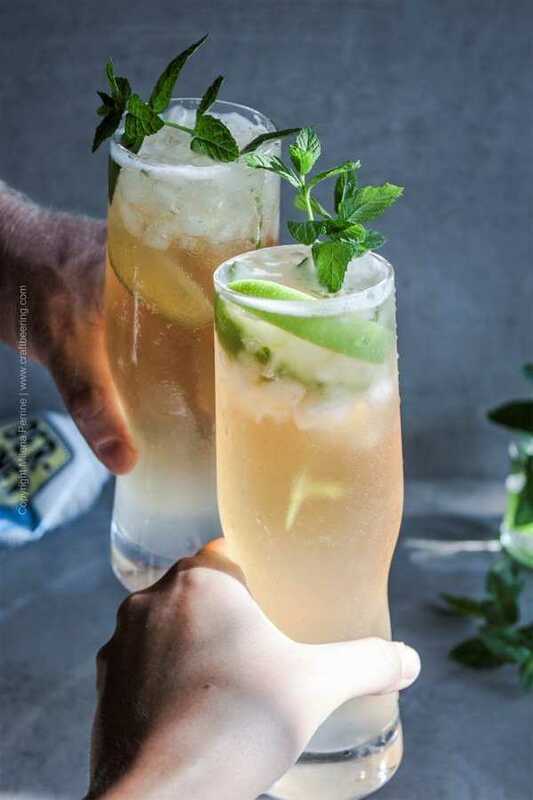 Fresh mint, white rum, simple syrup (preferably prepared with cane sugar), crushed ice and limes (juice and wedges for garnish). You will also need a muddler (or the handle of a wooden spoon, works perfectly fine), a jigger and a cocktail shaker. If you are a fan of Berliner Weisse style sours or at least have tasted a few you already know exactly why this is the perfect beer to mix a mojito with. If you have never tasted a Berliner Weisse you ought to. Soon. It will impress you even if it doesn’t become your favorite style. 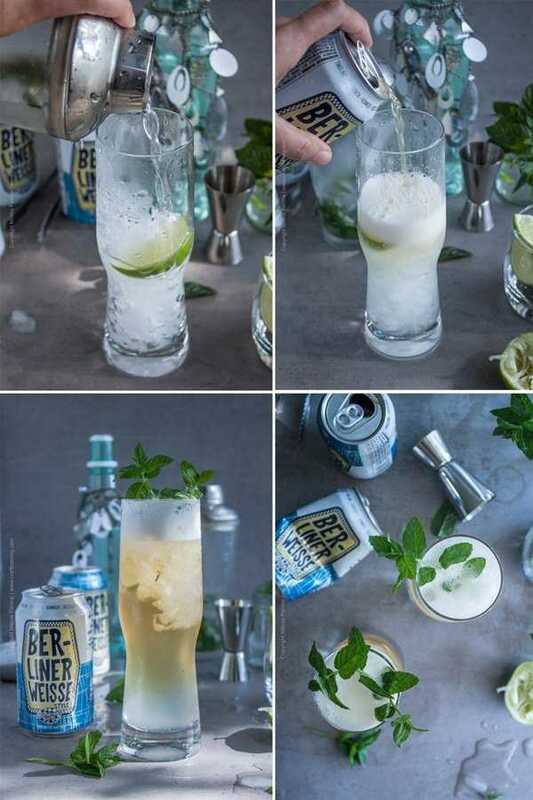 I have a feeling that if you are here reading about a beer mojito, chances are that you will love the style. Berliner Weisse is a straw-colored German sour wheat ale which literally lacks bitterness. It is particularly effervescent and refreshingly tart. So much so that it has been referred to as ‘the Champagne of the North’ by Napoleon Bonaparte himself. Soured with Lactobacillus bacteria and warm-fermenting yeasts it tastes akin to unsweetened sparkling lemonade. It is typically low in alcohol with ABV 3.1-5% so it will not make the cocktail too strong but will add a ton of flavor. Only ales brewed in the city of Berlin can be called by the name, if brewed elsewhere, Berliner Weisse style ale is the proper reference. I used Ska Brewing Berliner Weisse style ale. You will pretty much follow the steps to mix a regular mojito with the exception of being generous with the lime juice. This is because in the presence of Berliner Weisse a simple squeeze of lime and a lime wedge garnish is sufficient. 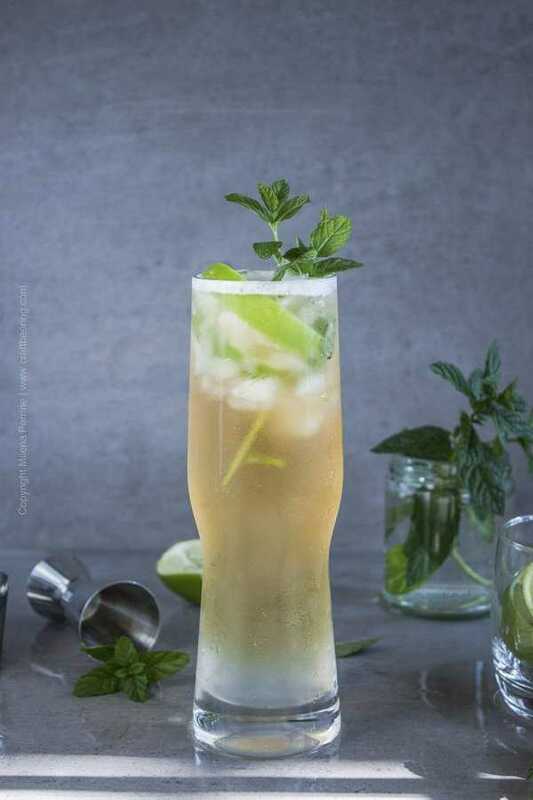 Start with fresh mint leaves at the bottom of a cocktail shaker, add rum, a squeeze of lime juice and simple syrup. Muddle to release the flavors from the mint and then add ice. An energetic shake (for 10-15 seconds) to get the ingredients chilled and blended together and you can go ahead and strain them directly into a glass. I like to use a pint sized tall glass about a third filled with ice so I can fit more of the sour ale in it:). Add the Berliner Weisse style beer, garnish with lime wedge or two and a sprig or two of mint and enjoy. The foam will be short lived and dissipate quite fast. Use a cocktail stirrer or a straw if you want to help it along. What Other Craft Beer Styles are Suitable? Even though Berliner Weisse is a very popular summer style as of late, if you cannot find it get one of the following styles. Gose – similarly fermented, also refreshing, tends to be a bit more tart and has salty, minerally notes (originally due to the water it was brewed with, now actually brewed with salt). 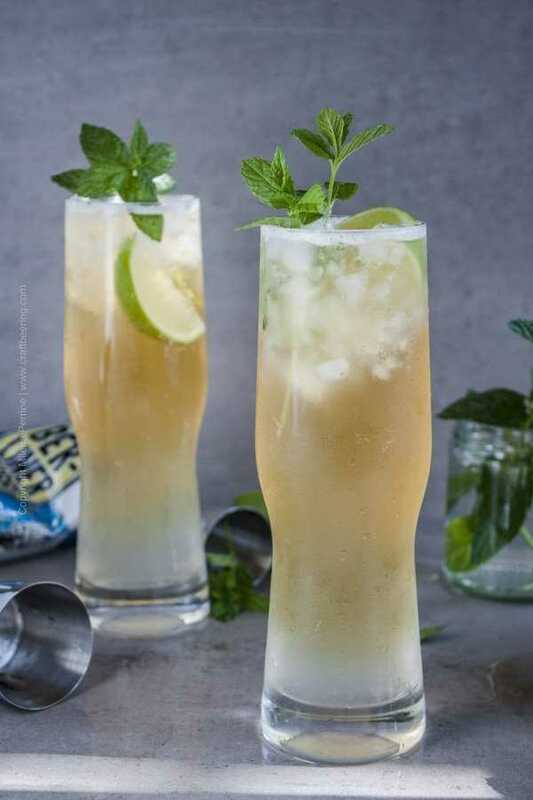 American style wheat ale – the yeast used to ferment this style imparts bright lemon and lime notes but since the beer is not sour add more lime juice instead of just a squeeze. Fruit flavored sours – if you are looking to make your beer mojito extra creative and flavorful, consider a raspberry sour ale or an apricot sour ale and garnish with the same fruit. 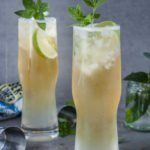 The classic mojito cocktail gets a flavor boost from highly effervescent Berliner Weisse style sour wheat ale. In a cocktail shaker add the mint leaves, rum, squeeze of lime juice and simple syrup. Press them with a muddler or the handle of a wooden spoon to release the aromas and flavors of the mint. Add a cup of ice, place the shaker's lid and shake vigorously for up to 15 seconds. Fill a glass with ice, strain the cocktail over it and fill with Berliner Weisse beer. Garnish with lime wedges and mint. Love the pictures of the step by step. Makes me want to make it! We actually have everything other than the Berliner beer which we might find at our local liquor store (a well-stocked one!). I think I might like this version better than the regular mojito (because of the beer 😉 )! I love mojitos and your creation by substituting the club soda with ale! I can’t even imagine how yummy this must be 🙂 This recipe reminds me of drinking (a few too many) mojitos at my sisters wedding hahahaha. I’ve never heard of Berliner Weisse but I love the sound of it–unsweetened lemonade sounds perfect right about now! (It’s hot. Really hot. And I really don’t care for sweet drinks. . .) I’m definitely going to try this one! I agree! Perfect for the heat blasts we’ve been experiencing. Thank you, Kelsie!